A PLE would be an accumulation of tools selected by the learner to support and organise their own learning. How can we use them to the full? I may use Diigo to tag and store interesting links that I come across, I may use blogs as a way to share my thoughts and Google Docs or a Wiki to collaborate on a report with my tutorial group. Each tool has a particular purpose and can even be combined with other tools to create something completely different eg using a storymaking tool on an iPad to create a personalised story. As you can see, my personal learning environment does not just include interaction with formal learning tools. Personal Learning Environments (PLEs) recognise that learning is lifelong. It always continues using all the tools available to us. Some Universities and formal learning institutions fear that their hold over students’ learning is slipping away. The challenge is allowing student PLE’s to align or interact with formal Learning Management Systems (LMS). Systems like Moodle and Blackboard are places where Universities manage learning and distribute course content and are often tested for accessibility and ease of use. 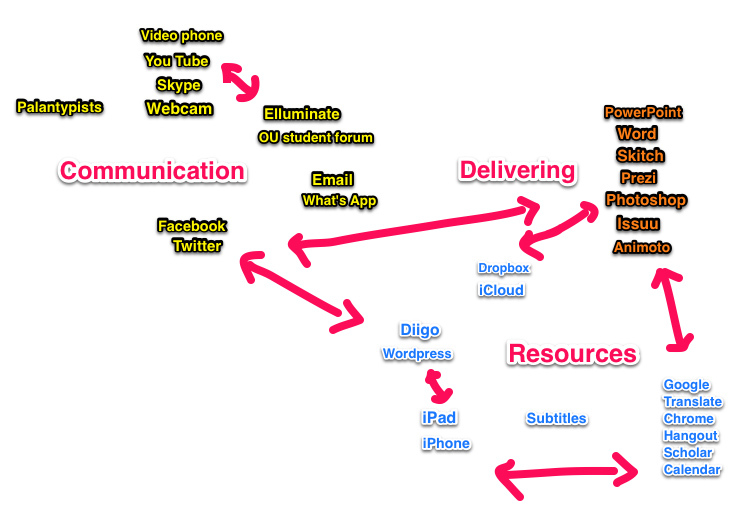 However these environments may be separate to the multitude of tools students use everyday. I’m with Weller when he says that the goal is not to teach students how to use a particular LMS, but to teach them general skills so that they come away knowing how to advance and manage their own learning. It is a given that some students may need more guidance on their learning journey. And the LMS within formal learning institutions need to be solid enough to manage students’ learning without “losing control.” However the “losing control” concern may be unfounded. The explosion of Web 2.0 practices was down to the flexibility provided to users in expanding on and exploring learning tools. Twitter within Universities would not have happened if it wasn’t for learners helping bridge the divide between their personal spaces and universities. The interaction between PLE’s and LMS’ should be encouraged, and each domain be known for it’s advantages. The key is to predict the impact of, and share PLE tools within formal education. While it may be a case of Universities playing “catch up” in this fast moving environment if we see it as Weller sees it, seeing the general skills that students require and allowing them to use learning tools that best fit with this skill attainment whether it be via the LMS or the students’ own PLE. We could see this as the creation of learning pathways. And trusting the progression along this pathway of learning to achieve end aims. Sclater, N. (2008b) ‘Web 2.0, Personal Learning Environments, and the Future of Learning Management Systems’, Educause Center for Applied Research, Research Bulletin, vol. 2008, no.13.